College entrance essays (also called application or admission essays) help to sort out students that stand out from the crowd. They are often used to choose between students with similar academic qualifications: admissions staff are looking for that "something extra" that marks out bright or dedicated students. Sometimes these essays are personal statement essays. In other cases college entrance essays will be on some subject related to the course applied for. In either case the college entrance essay is one of the few parts of the application process over which the student has complete control. Admissions staff are looking for evidence of carefully planned, researched and edited submissions. They are looking for college entrance essays that are well structured, carefully presented, persuasive and to the point. * Your essay must have a main theme. If you try to be too wide-ranging, for example by writing your autobiography, you could end up with a rather wishy-washy essay which doesn’t cover anything in much depth. Such an essay is likely to be thought of as rather superficial. * If you have a choice about the subject of your essay think about it carefully. Don't just write what you think the admission officers want to hear. They’ve probably read plenty of essays about how wonderful their university is and how dedicated their applicants are determined to be in their chosen study or career. * Your theme should be obvious from the outset. It should be possible to determine your theme from the introduction. Get someone else to read your introduction and then tell you what she or he thinks your essay is about. If it’s not clear to them, or if they get they wrong impression, you need to think about revising your introduction. * Develop your main idea with vivid and specific facts, reasons and examples. Support your opinions and conclusions with well reasoned arguments and evidence. Show your reasoning, don’t just state your conclusions. * Use quotations sparingly and only when they are completely relevant (and preferably by someone reasonably distinguished in the field). Don’t use quotations to avoid having to say things in your own words. * There should be no new information, arguments or examples in your concluding paragraph. This should be a summary of the most important main points and conclusions. * Make sure you know how to reference your research material properly, both in the text and at the end of your essay. * Make sure you edit your essay, several times if necessary. * Think about the structure. Is everything in the right place for a logical development of your theme? Is anything missing? Have you kept to the point? However interesting you need to get rid of information that is only marginally relevant to your main theme. * Think about how you’ve worded your sentences. Have you been overly verbose? Don't use five words when one will do! * Look out for typing, spelling and grammatical errors. They may be interpreted as carelessness or bad writing. Don't rely on your computer's spell checker, it can miss some errors and mistakes. 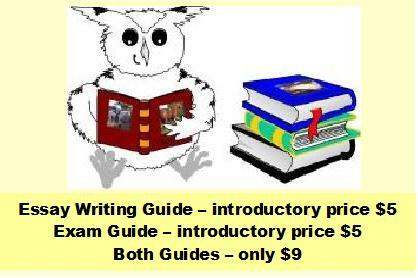 * If you have any doubts at all then get more advice about the process of essay writing. You’ll find that most of your time should be spent in the preparation and editing stages of essay writing, rather than in the actual writing itself. You could pay someone to help you. Better though to put your effort into learning how to do it yourself (especially since you’re applying for a course where essay writing will be required).